Antelope Valley Truck Accident Injury Attorney - Over 40 Years of Experience You Can Trust! Are You Looking for a Truck Accident Injury Lawyer in Antelope Valley, California? If you have been seriously injured in a truck accident in the Antelope Valley, including Lancaster or Palmdale, your main concerns should be your injuries, medical care, vehicle repair and your monetary recovery. But this can get extremely difficult when your medical bills are mounting and the other party’s insurer refuses to compensate you for your hospital and medical expenses, loss of wages and earnings, property damage and rental car losses. Also, if a family member was killed in a truck accident or other accident in the Antelope Valley, Lancaster, Palmdale or anywhere in California, you may have a wrongful death claim for all damages, including hospital and medical bills, loss of future income, loss of love and companionship, and, of course, all funeral and burial expenses. This is why you need to contact a skilled truck accident injury lawyer and truck collision law firm now to represent you. With proper legal representation, you can better secure the rightful monetary compensation for your expenses, losses, damages and suffering that you deserve. 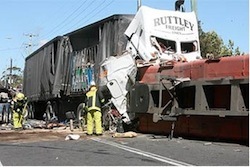 Motorists are especially vulnerable to devastating injuries resulting from truck accidents. Data from the Insurance Institute for Highway Safety (2010) indicates that car and other passenger vehicle occupants were far more likely to die in accidents resulting from a truck crash than those in the truck. According to this research, of all persons killed in truck accidents during this period, an astounding 97 percent were occupants in cars and other passenger vehicles as opposed to the drivers and occupants in the much larger and heavier trucks. Our experienced team of personal injury and truck accident injury lawyers helps injured victims and their families find their way through the complex legal procedure involved in truck accident claims, cases and settlements. Backed by more than 40 years of experience, we are known for our aggressive representation and administration of justice. Please feel free to visit our Truck Injury Accident Web Site and learn more about the truck accident injury claim procedure and, of course, to call us now for a FREE consultation and FREE case evaluation about your own specific case. You will be glad that you did! Antelope Valley is located in the southeast portion of Kern County and northern Los Angeles County, California. Comprising the western tip of the Mojave Desert, it is located between Tehachapi and the San Gabriel Mountains. As per the 2010 United State Census, Antelope Valley had a population of over 475,000 people. Palmdale and Lancaster are the main cities of this valley. Our experienced truck accident and truck collision lawyers and law corporation offer aggressive yet compassionate legal services for our clients with personal injuries or wrongful death claims in Antelope Valley, Palmdale, Lancaster, Los Angeles County, Kern County or anywhere in California. Vast experience in resolving inflicted personal injuries and wrongful death cases throughout Antelope Valley, Los Angeles, the San Fernando Valley, Ventura, Orange, San Bernardino and all of California. Success rate of over 95%. Immediate assistance with medical attention, property damage repair and settlement, loan cars, monetary advances, medications, prescriptions, etc. One frequent cause is truck drivers ignoring regulations and procedures regarding the number of continuous hours they are supposed to drive, which leads to fatigue, falling asleep and serious injuries and sometimes even deaths with wrongful death claims. To counter fatigue, some truck drivers take OTC substances and medications in order to stay awake. Sometimes they work, sometimes they injure the health of the driver, and sometimes they are NOT sufficient and bad collisions with serious injuries and/or deaths result. Know that help is here, when you or a loved one is injured in a truck accident in Antelope Valley, including Palmdale, Lancaster, Los Angeles and Kern. We have more than 40 years of legal experience and a proven record of successfully representing personal injury and wrongful death claims victims throughout the Antelope Valley, the San Fernando Valley, Los Angeles, Ventura, San Bernardino, Orange and all of California. We are committed to protecting your rights and helping you with medical care and the best monetary recovery possible if you were the victim of a truck accident, car accident or other accident in the Antelope Valley or anywhere in California. Call us now for your absolutely FREE, no-obligation consultation at 1-866-INJURY 2 or 866-465-8792 or 818-222-3400 (after hours, please press 1), to learn about your rights, responsibilities and how we can assist you further. Moreover, you can email us at info@WalchLaw.com or simply fill our easy contact form to tell us about your case. Please do NOT delay as there are many procedural and time deadlines that may limit or even prevent your claim when not properly complied with.